We, the people of Morgantown, must sign the contract tonight to buy the Haymaker Forest. It’s the only way we guarantee we have absolute control of our land—and the conversation about our land. We cannot wait for a savior. Not in this life. In this life here, on earth, the earth that is ours to share, we must be our own savior. The $5.2 million price tag is somewhere between 2 and 4 times higher than its appraisal value. There is no mechanism in place to fund the purchase. The city has more pressing issues to spend $5 million on. Mark Brazaitis should not have introduced, debated or voted on the proposition, because his adjacent property stands to gain significant value. The best solution for you is to form a partnership with your other neighbors who own property around the forest to either go to the bank to get a loan so you can purchase the forest yourselves... and/or to start raising funds - that way anyone who is interested, can donate. Regardless of their focus, the comments were nearly unanimous in their disapproval of the deal. This set the stage for an entire day of debate about the project that would end with a failed legal injunction and a long, contentious city council meeting. The Morgantown public learned about the city's potential $5.2 million purchase of Haymaker Forest on May 31st, six days before city council took the first of two votes on the issue. The council voted to pursue the purchase almost unanimously, without having seen an appraisal of the land's value. Only 5th Ward Councilor Ron Dulaney cast an opposing vote. An emergency injunction hearing was scheduled to essentially decide whether Morgantown City Council would have the authority to buy Haymaker Forest later the very same day. The Appraisal: There are actually two figures, which is why everyone seems confused about how much the land is actually worth. High Cost: The plaintiff's attorney noted that at least two city council members had admitted in radio interviews that there were no line items in the budget to pay for the purchase, and that Mayor Kawecki had publicly called the process "a leap of faith". Clawges acknowledged that this might be a poor deal, noting that it was "obvious that [the deal] was drafted by the seller" and "heavily weighted toward the seller." But he also said that there is no law about how much the city can spend on property, or about how close to appraisal value it must be. Mark Brazaitis: "If only public officials would learn about the dangers of social media..." Judge Clawges said of Brazaitis's early morning post. The city and the judge both tacitly acknowledged that the Deputy Mayor should have recused himself from the vote due to a conflict of interest. But Judge Clawges said that even if he had, the vote to purchase the property still would have been 5-1 in favor. The outcome would have been no different. The plaintiff's attorney argued that because Brazaitis had initiated the whole plan, the entire thing should be null and void, but Clawges wasn't buying it. Irreparable harm: Much of the case depended on whether the citizens of Morgantown would experience "irreparable harm" if the city couldn't pay what it promised. On this matter Clawges said, "Dollars do not equal irreparable harm." He contrasted the situation with a bulldozer about to knock down a house, which he said would meet that criteria, making a clear distinction between financial harm and physical harm. Urgency of Purchase: The city believes that there is another offer on the table to purchase the land, which is why Brazaitis and others have been moving the process along quickly. Clawges asked the city attorney, Ryan Simonton, "Did the seller tell you that?" When Simonton said they had, Clawges replied, "That's not unusual." He also noted that the property has been sitting undeveloped for as long as he could remember, and that the city council rejected a proposal to buy the land not that long ago. Separation of Powers: This was the primary reason the injunction to stop the purchase of Haymaker Forest was denied. Clawges accepted the city's argument that courts do not have a prerogative to interfere in the lawfully conducted business of representative bodies like city councils. It is simply out of the court's jurisdiction to prevent transactions like this, regardless of their costs or impacts. Summary: Judge Clawges decided not to interfere in the sale of Haymaker Forest to the City of Morgantown. Four hours later, city council would convene to cast a vote and possibly sign the contract. Wendell stated on Friday’s Morgantown AM on MetroNews affilate WAJR, he doesn’t expect to see a large crowd opposing the purchase. “I don’t think that’s going to happen,” Wendell stated. Morgantown responded with vigor. By 7:00, the chamber was full, the standing room just outside the door was full, and the downstairs lobby of the building was approaching capacity. 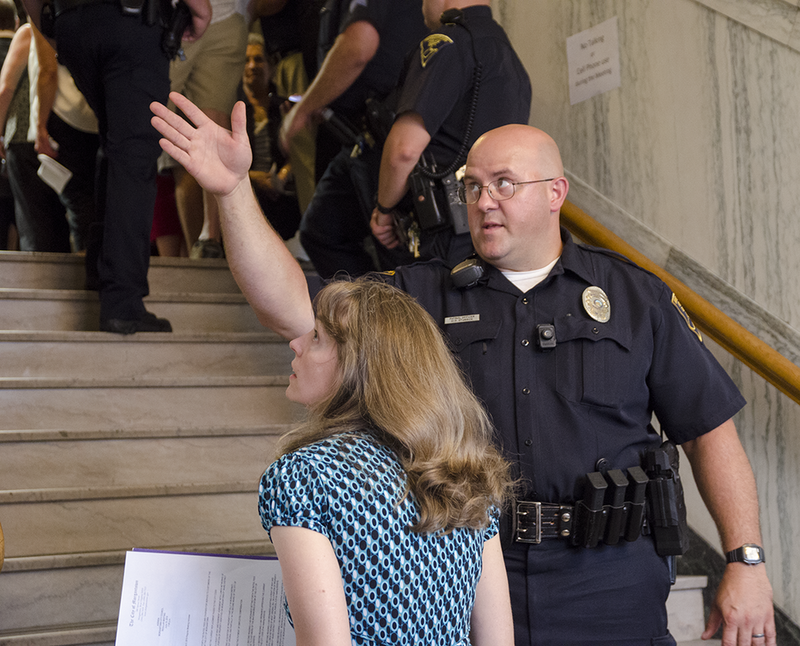 A group of police officers talked to each other in the lobby about how to manage the crowds, moving people off the stairway to remain in compliance with fire codes. Frustrated, sweating people - some with children in tow - could not hear the television in the lobby. For four long hours, the city council was excoriated over the handling of the Haymaker deal. Repeatedly, the public opened their comments with some variation of: "First, let me first say that I love green space," inevitably followed by reasons to disapprove of the Haymaker deal. Several began by noting that they had voted for the sitting councilors, but were disappointed and having doubts about the fiscal responsibility of their favored candidates. Retirees spoke about their fixed incomes and inability to pay more in taxes, social service workers spoke about the desperate need for money to support children and families with very little, Fire Chief Mark Caravasos (and several firefighters) spoke about their need for construction and upkeep of facilities. It went on and on, even as many speakers summarized or deferred to others when their points had already been addressed. While most speakers by far opposed the measure, several made arguments for going through with the deal. The tearing down of more Morgantown forest, the additional traffic, and the excess strain on the sewage and water quality were all discussed in connection to the townhomes that will supposedly be built on the site without the city's deal. At 11pm, all speakers had finally said their piece, and it had been made abundantly clear that Morgantown was not happy. Mark Brazaitis was given the first opportunity to respond. He characterized the meeting as a win for everyone, and suggested that progressive taxes on the wealthy could be used to bring more funds into local coffers. "Go ahead and argue about it on Facebook. Call me what you will. Richer, wealthier, more privileged people in our community should pay more. That's my position," he said. Brazaitis noted that his family has been terrified after the aggressive language used on social media about his role in the deal, and has asked him to stop pushing for it. But he believed in the potential of the forest for the city. Most of the other city councilors emphasized that while some of the more fanciful conspiracy theories surrounding the council's approach to Haymaker had been flat wrong, that the voices of the public had nevertheless been heeded. "You have not been unheard. We always want feedback. We never try to sneak something past the voters," councilor Wallace told the remaining audience. Councilor Wendell, who had issued the challenge to show up to the meeting, took a decidedly more argumentative tone. "The people who spoke in favor of this, all but one of them are friends of mine that I know. The people who spoke against it... are people I never met before. So where have you been?" "There are two kinds of people," Wendell continued. "There are visionaries, like Mark and me, where we have these big ideas and see something that could be. And then there's people like Ron Dulaney who say, 'Wait a minute, we can't pay for this. This is stupid.' "
Wendell also took a jab at WAJR, who had published his challenge and was livestreaming the meeting to all those who couldn't make it or chose to leave the crowded chambers. "The people of WAJR are not necessarily friends of the city either," he said. In the end, the city postponed the issue, meaning that it would be brought back to council at some later date as the city tries to negotiate a better deal. Mark Brazaitis was the only dissenting vote, though several councilmembers remained hopeful about the possibility of the future purchase of the land. It remains to be seen whether the delay will cause the owner of the property to sell to a developer as claimed.